Today, 505 Games issued a massive patch for the Switch version of Portal Knights. The game is now at version 1.5.2, and has brought in the Creator’s and Villainous Update. There’s tons of new content, improvements, and fixes here. Players will find a Creative Mode, new bosses, faster loading times, and more. · Creative Mode – Create your own islands using unlimited resources. · Landlubber’s Leap – A pirate’s paradise with new quests, characters and more! · Armor – Reworked, rebalanced and renamed! Plus, new epic and exotic armor! · Receive weekly gifts from Mailboxes! * New NPCs with additional dialogs and quests. * New rewards for the player. * New merchants selling current and new items. * New hair and beard styles. * New NPCs with additional dialog and quests. * New merchants with a mixture of old and new items. * New decorative props like the new kitchen set and ranger themed items. o Several new home décor props have been added, including bathroom furniture, kitchen-themed items, cage doors, awnings and potted plants. o Water pumps and drains are available. An unlimited water source item is available in Creative Mode. o Players can craft three types of gift boxes containing items from a pool of resources, such as valuable crafting ingredients, furniture sets, vanity items, etc. 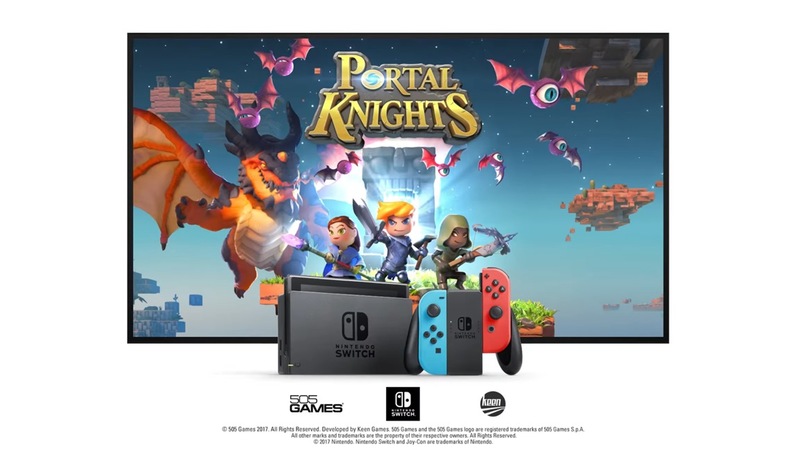 If players want to gift somebody a little Portal Knights present or want to give out prizes for a challenge or tournament they can use those boxes. o Traps are now available for Rangers to use against enemies. o Tutorial NPCs can now also be picked up and be relocated. o NPC merchants offer more consistent gold coin prices now. o Mailboxes in the game will now periodically have gift packages for the players. The mailboxes can be crafted and placed anywhere but they can also be found at major forts or villages. o New gifts can be collected once per player account. o All bombs, artifacts, and potions — except health and mana potions — are now crafted at the new Alchemy Table. o An “Automatic Camera” option has been added and enabled by default. The Automatic Camera will track the player and position itself behind them. If the Automatic Camera doesn’t work for you, you can switch to the classic camera setting at any point. o New side-by-side chest menu! When you open a chest or other container, you’ll now see a handy side-by-side view of your backpack and the chest, along with shortcuts for mass item transfers and stacking. o Consumable items and recipes can now be used directly from your backpack (via the More Actions menu). o Completed events now grant XP and gold. o Added rare drop chance for pirate trophy to hollow knight pirates. – Dungeon chests, bosses and enemies have been reworked to drop more interesting loot. – Object highlighting shows more clearly which objects on the island can be interacted with. The types of interactions are now specified as well. – The camera smoothing option has been removed as it didn’t have the desired impact. – Block drops from enemies have been replaced with items that better match the player’s progression through the game, like resources for potions. – The recipes for potions have been reworked in areas where resources were too hard to obtain or required the player to jump between islands too much. – Quest and boss key items can no longer be trashed. They can still be dropped into the world to exchange them between players etc. – The quest system has been reworked – regenerating a universe no longer resets quests. – Added variants of gold coin drop models to signify larger gold drop amounts. – Remaining event time is now shown in the quest HUD. – Fast travel by gamepad has now dedicated hotkeys for going home and returning to landing pad. – Completing quests shows a new quest completion popup. – High value items now have new VFX when dropped. – NPC greeting sounds trigger now when the player is closer than before. This should improve greeting spam in densely populated areas. – The drop chance for sharpening stones, traps, tomahawks and totems has been increased. Cooldown for health and mana potions has been reduced. – Split screen handling in the pre-game menus has been improved. – Gaining HP or Mana no longer counts as combat. – Fixed a bug with loot sometimes being dropped twice. – Fixed the bug that players would sometimes get stuck in their movement for no apparent reason. – When returning to Maria with the C’Thiris mask equipped as a helmet, she correctly recognizes now that the player owns the mask. – The “Shout”-quest from Guildmaster Rudyard in Fort Finch now correctly counts the Gazers that have been affected by the shout skill. – Fixed events with portals to have the correct portal stone color now. – Improved the saving process to avoid issues in certain edge-cases. – Improved the enemy drop rates of some event specific resources to make events less grindy. – The mana orb drop rate from enemies does no longer scale up with player count in multiplayer. – Improved HUD elements layout for split-screen mode, especially XP bar and oxygen bar. – Jumping feels more consistent now. – It is possible to assign the stick axis to any action. This can cause movement or camera to not work properly anymore until resetting the button bindings. Future updates will prevent re-assigning the stick axis. – If you don’t have an active Nintendo Switch online membership, sometimes the warning message will be incorrectly displayed as error message when trying to create or join an online session. In follow-up to the weapons rework in Update 1.3.0 we have also reworked armor progression and loot drops. Our goal is was to give you more meaningful rewards after completing a dungeon crawl or a boss fight. At the same time this simplifies crafting lists and gives players more choice when deciding what armor to craft next. When finding chests in dungeons you are now rewarded with special armor pieces. Complete sets by collecting all their pieces! The remaining armor recipes have been restructured. Whenever you access a new pool of resources with which to craft armor, you are no longer forced to craft something specific. Instead, you can choose from up to two equally powerful sets of armor. In order to ensure all the armor is useful and to give players real choices, we had to revise nearly all armor stats and character level requirements. This change made the previously dropped armor recipes redundant, so we removed them from the game. Any armor you crafted using those recipes will remain in your inventory, however. We hope you love the new armor system as much as we do!